Gernitex sheets consist in unidirectional (UD) or woven layers of carbon fibers impregnated with a thermoset or thermoplastic material. These carbon fiber sheets have specific rigidities and strengths up to several times that of aluminum or titanium and can be processed either by bonding or thermoforming to produce composite parts. 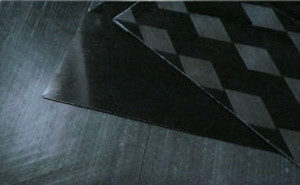 Available matrices include polyester, epoxy and thermoplastic materials. Default finish is one smooth side and one textured side for bonding. Do you need a custom sheet ? Please contact us. [0°/90°] laminates can provide torsional reinforcements while minimizing weight. An application is the manufacturing of lightweight model airplane wings. [0°/+60°/-60°] laminates are quasi-isotropic. They exhibit the same properties whatever the in-plane direction. As homogeneous reinforcements, they can be used as single-ply skins for sandwich structures. [0°/+60°/-60°/-60°/+60°/0°] laminates are quasi-isotropic and symmetrical. When subjected to temperature variations, they are less prone to deformation by thermal dilatation. This property makes the manufacturing of thermoformed composites parts more reliable.